Modern day online casinos are almost unrecognizable from those that were around in the early days of online gambling. If you ever played at some of the first online casinos, then you'll know exactly what we mean but if you've only been playing more recently, then you'll only be familiar with the high quality casinos of today. The fact of the matter is that the software used by online casinos these days is far more advanced than it used to be. Technology has obviously evolved, which has led to enhancements in visuals and audio, plus there has been an array of innovation also. Game play and the overall experience is way better and there's a wider variety of games to choose from as well. One of the primary reasons why casino software has improved so much is because it's generally developed by specialist gaming companies rather than by the casinos themselves. Some casinos do still develop their own software, known as proprietary software, but the majority of them use third party providers. Some of them use a single provider, while the majority of them use two or more in order to provide their customers with a diverse range of games. 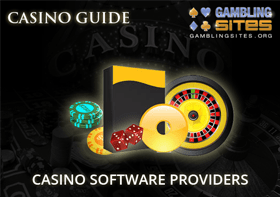 In this section we've provided details on all the major casino software providers and the games they have to offer. You can find a brief overview of each of these below and we've listed a number of other providers too. There's also some information on the different types of software available, along with answers to some frequently asked questions on offer. Real Time Gaming, usually known as just RTG, is a company that got in on the online gambling boom very early. They were formed in 1998, in the American state of Georgia, before moving their base to Costa Rica. RTG has developed a large number of games and their range of slots is particularly popular. Plus, they're actually one of the biggest companies to supply US facing online casinos. Playtech is a major player in the online gambling industry. They operate the successful iPoker network as well as supplying a large number of online casinos with games. The selection of games they've developed is very diverse but they're probably best known for their incredible range of slots. One of their best known series of slot games are based on the characters from Marvel Comics. This company began life owning and operating an online casino, way back in the very early days of online gambling. Microgaming consequently moved into supplying other casinos with software, including an impressive suite of games. They have developed a huge number of games over the years and continue to regularly produce innovative and unique games to this day. Net Entertainment, often referred to as NetEnt, has a real success story. The company was set up in 1996 by a major land based casino operator in Scandinavia and has steadily been growing ever since. Their wide range of games, which is made up predominantly of slots, is now available at many of the biggest and best known gambling sites around the world. International Gaming Technology, or IGT, has been in the gaming industry for many years. Formed in 1971, the company started out supplying gaming machines to land based venues. They also developed tools for player management, before diversifying further into online gaming. This is a huge company that supplies many sites with software. Evolution Gaming is a leading specialist in the provision of live dealer casino games. The company was only founded a few years ago, but it quickly won some big contracts with major operators. Demand for their services was soon on the rise, and they now supply their live games to a wide range of gambling sites. They were one of the first to offer mobile live games. WMS Industries dates back several decades, all the way to the 1940s. They were involved in the pinball industry back then and have continued to be involved in some form of gaming ever since. The company developed several popular video games during the 1980s and 1990s and recently formed Williams Interactive as a subsidiary to focus on online gambling games. Betsoft produces some of the most advanced casino games found on the internet today. They supply a number of operators and they're best known for the incredible 3D graphics and animation that's commonly featured in their games. Their slot games are truly ground-breaking and they develop a range of video poker and table games as well. If you've played many online slots games, then there's a very good chance you've played at least one developed by NextGen Gaming. Formed in 1999, this company expanded at a fast pace and was soon supplying several online casinos. They have developed hundreds of different games, winning several industry awards along the way. There are a plethora of other casino software providers in addition to those we've listed above. Below are some of the more notable ones. A number of these are also big companies, just not as widely used as the major ones, while others are much smaller operations. They all provide some good quality games and we'll be adding additional information about them in the near future. Online casino software can be broadly categorized by format. There are four main formats of casino software which are listed below. Some providers specialize in developing software in a single format, although this is now quite unusual as the majority of them develop software in a range of formats. The exception to this is providers of live casino software because they do tend to focus entirely on that specific format. The majority of providers develop software in a range of formats though, often producing multiple versions of the same games. For example, a provider may produce its most popular slot games in download format, instant play format, and mobile format. Casinos that develop their own proprietary software generally do the same. The reason for this is that most online casinos want their customers to be able to play their favorite games in a variety of different formats, according to their own needs and preferences. Some players prefer to use download software, others prefer instant play, and mobile gambling has become extremely popular in recent years as well. Please note that you can read about the different types of casino software in detail in our section explaining the basics of online casinos. This section covers how online casino software works and a variety of other related topics too. Is Online Casino Software Fair? For the most part, online casino software is perfectly fair. Most online casinos, and certainly the reputable ones, have their software regularly tested by external companies to ensure that it is. In fact, if you're gambling at a casino that's properly licensed by a reputable gaming authority, then you can be confident that you'll be playing fair games. The major software providers do their own testing too, giving you an extra level of protection. There have been a few cases over the years of online casinos using software that isn't fair, but these cases are very rare. Some such cases have been down to genuine errors, with customers recompensed for any losses they have incurred while others have been down to rogue operators whose goal is to cheat their customers. Rogue operators are an unfortunate reality of online gambling. There's so much money involved in the industry that they are bound to find some unethical individuals and organizations looking to make a quick buck. Thankfully, there are plenty of reputable and trustworthy places to play and it has become relatively easy to avoid rogue online casinos. The main reason that casino games work as a form of gambling is that they all have some element of randomness, such as the turn of a card or the roll of a dice. This randomness is what makes outcomes unpredictable and for online games to be realistic it needs to be replicated in some way. This is where random number generators come in. Random number generators (abbreviated to RNGs) are a specific, and very important, component of online casino software. They continuously generate complex sequences of numbers at random, enabling the software to produce unpredictable results in the same way a live casino venue does. This is a very simplistic explanation, but for extra information you can read more about RNGS and how they work here. Why Do Online Casinos Use Software Providers? The main reason why online casinos use software providers is because it's an effective use of resources. The standard of the casino games available online has improved dramatically over the last couple of decades and it continues to improve today. The leading providers are at the very cutting edge of technology and innovation. The games they develop are high quality and are designed to give players exactly what they want. For an online casino to keep up with the standard set by these providers, they would need to dedicate a significant amount of resources to developing its own software. It simply makes sense to take the easier (and often cheaper) option to use external providers. This enables them to focus their resources directly on other important operational aspects of their business, such as attracting and retaining their customers. Using external providers also allows online casinos to offer a much wider variety of games than they otherwise would be able to, particularly if they use multiple providers. Many of the top casinos do exactly that, and it's part of what makes them so popular. Most players enjoy trying a myriad of different games, so the more choice they have the better. Another benefit is the size of the jackpots they are able to offer. The biggest progressive jackpots available online are generally found in games from software providers that supply a number of casinos. If a progressive jackpot game is available at a variety of different casinos, then it will be played by more people which will typically result in the jackpot growing more quickly and to a higher amount. Are Casinos Using Proprietary Software Worth Playing At? They can be, yes. There are some casinos using proprietary software that are perfectly good places to play. It's quite unusual for a casino to only use proprietary software these days but there are a couple of examples. There's no reason not to play at such a place if you like what they have to offer and enjoy their games. Does It Matter Which Provider An Online Casino Uses? Absolutely it does. There are lots of different providers for casinos to choose from and they aren't all of the same standard. It obviously makes perfect sense to play somewhere that uses one of the top providers, simply because you'll experience a better quality of game. There's also the matter of personal preference to consider. Your favorite games might be by a particular provider, so it's important to play at a casino that offers that specified provider. Ideally you should consider using a casino that uses multiple providers, as this will give you access to a wider range of games than one that only uses a single provider. This is ultimately a matter of personal opinion. Some players love the slots from NetEnt, while others prefer those from Real Time Gaming. Some players like Playtech's range of table games, while others prefer Microgaming's. Our view is that all of the major software providers we've listed on this page offer top quality games and many of the smaller companies we've listed do too. We have our own preferences in terms of the games that we enjoy the most but we wouldn't state that any of these providers is definitively "the best." The important thing when it comes to choosing where to play isn't necessarily which software is the best but which casino offers the best overall experience. Obviously the software and the quality of the games is a big part of that but there are other things to consider too. You can take a look at our guide to choosing an online casino for some advice on this subject or you can simply try out one or more of our recommended places to play.